These are Maggie Anderson’s rescue boys. 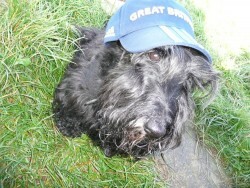 And today is the 11 birthday of Declan, the adorable black scottie. Maggie has chosen this date because when they came into her life no one actually knew the correct date of their birthdays. Declan, as I’m sure, doesn’t mind, so long as he gets lots and lots of treats. So lets wish Declan a very very happy birthday. Don’t worry, we’ll be visiting Jeffree (the wheaten) next month to celebrate his 13th birthday!